In Harmony Sistema England (IHSE) is a charity, chaired by Julian Lloyd Webber, promoting the values, principles and methodology of Venezuela’s El Sistema, adapted to an English context. IHSE supports In Harmony and other Sistema-inspired projects that use music to bring positive change to the lives of children across England, delivering benefits to the wider community. IHSE promotes, fundraises and creates opportunities for the development and expension of these projects. In Harmony is a national programme that aims to inspire and transform the lives of children through community-based orchestral music-making. It uses the principles of Venezuela’s inspirational El Sistema. 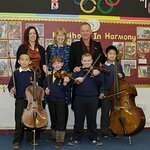 In Harmony is jointly funded by the Department for Education and National Lottery through Arts Council England. Google trends for "In Harmony"
We don't have any videos related to In Harmony.